We present the Trousseau Show, aimed at your glamorous evenings and those beautiful days where you adorn your finest fashion wear and accessories. To make your evenings come alive, we’ve got a day of fashion shopping set aside exclusively for you, so that you can concentrate on shopping for what you like, as you like it. Choose from various exhibiting stalls, with their variety of couture, fashion and accessories, apart from home, lifestyle and décor products that will fascinate you. It’s an opportunity to load your wardrobe all over again with the finest unmatched deals available anywhere in the city. 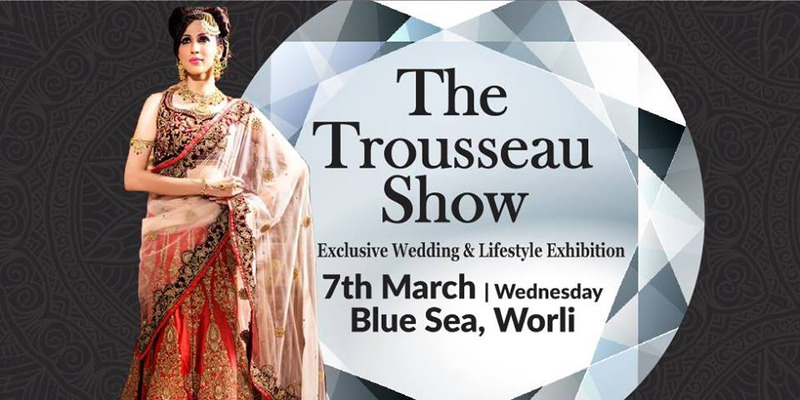 The Trousseau Show will be held at Blue Sea, Worli, one of the city’s iconic locations that present a super atmosphere for shopping. Soak up the ambience and cycle through the many fashion products (ethnic and indowestern wear from across India) and accessories (contemporary and traditional fashion jewellery, costume jewellery, semi precious and real jewellery), and regular and festive home decor products from gift articles to artifacts to soft furnishing offered by unique exhibitors and creative designers. It’s a day of shopping that will leave you recreating your future wardrobe for sure! The exhibition is targeted at females and families, and we urge you to ensure that you come prepared as early as possible and invite your friends too, to ensure you get a chance to visit every exhibitor's stall.